If you have more than one child, no doubt you have discovered they do not learn the same way even though they live in the same house, are being taught by the same person, and are growing up in similar circumstances and environments. Maybe your son learned to read using a healthy dose of phonics, but phonics mean nothing to your daughter. People are essentially different! Their individual gifts or bents are called learning styles. 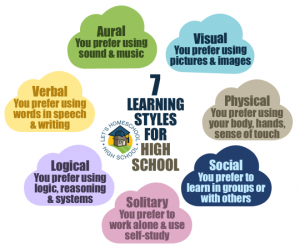 So what are learning styles? Learning styles simply group common ways people learn and store information in their brain. Each person is born with tendencies toward one main style. There is no best style. There is no right or wrong style. Each style has its own advantages and disadvantages. There are seven different learning styles. Typically everyone has a mix of learning styles. There is no one correct way for high school students to learn. Some people are evenly split between one, two, or maybe even three different learning styles. Other people might be more of a 80/20 or 60/15/25 split… you get the picture. ~Visual (spatial): You prefer using pictures, images, and spatial understanding. ~Aural (auditory-musical): You prefer using sound and music. ~Verbal (linguistic): You prefer using words, both in speech and writing. ~Physical (kinesthetic): You prefer using your body, hands, and sense of touch. ~Logical (mathematical): You prefer using logic, reasoning, and systems. ~Social (interpersonal): You prefer to learn in groups or with other people. ~Solitary (intrapersonal): You prefer to work alone and use self-study. Your job as the learning coach is to determine your child’s learning style(s). There are tests or quizzes that aid in helping you make determinations (look for links later in this article), however, you must also begin to observe patterns of behavior in your child. For example, if they are successful, what brought about that success? Listen to the way your child communicates with you and others, you might not speak the same language. Experiment with what works AND what does not work. What works for you might not work for them and vice-versa. Focus on areas of strength and weakness, but put emphasis on the strengths. Visual-spatial learners have a vivid imagination, they truly think outside the box. They learn by instinctive bounds. They remember what they see, not what they hear. Learning to read can be very difficult for them when they are being taught by a left-brained person or a left-brained homeschool curriculum. The public school tends to leave them behind, or worse, label them as slow learners when indeed most are gifted. nonverbally. These learners are sensitive to their motivations, feelings, or moods. Others often come to them for advice or help. Social learners usually prefer learning in groups or classes, so homeschool co-ops might be very beneficial. Don’t get too worried about learning in groups or classes, the social learner is also just as at home spending one-on-one time with you, the learning coach. There is no “right” mix when it comes to learning styles. What is key is understanding that because we all learn differently, it is the teaching style that must have the “right mix” in order for the learner to experience success more efficiently, more comfortably, and more permanently. Teachers most often teach in the style they learn best. As the learning coach, it is beneficial for you to discover your own learning style. Some learning coaches like to lecture, others demonstrate or lead toward self-discovery; some focus on principles and others on applications; some emphasize memory and others understanding. If you like to lecture and your child is a visual spatial learner, chances are they are frustrated and not retaining what is being taught. As you can tell, if you and your child are not on the same page, a mismatch exists. This can cause frustration for both of you. It does not have to be that way. The learning style quiz does not measure aptitude, it simply tells you how you learn best. Do not over-interpret them. They do not reflect whether or not your child is suited or not suited for any particularly subject, discipline, or profession. They merely provide an indication of possible areas of strength and weakness. However, knowing your child’s area of weakness is beneficial before reaching college. You certainly can not choose a professor based on his or her teaching style…you get what you get. Knowing your child’s weak areas ahead of time allows you to begin preparation for overcoming foreseeable obstacles. You and your child can begin to develop coping strategies to compensate for weaknesses and capitalize on strengths. The learning style quiz gives you, the learning coach, insight into the way you learn versus the way your child learns. Once you have that information you have the opportunity to craft your lessons AND your high school homeschool curriculum to match your child’s learning style. Keep in mind you will not score the exact same on any two quizzes, but you should see similarities among the results. Use the information from the tests coupled with observations of your child in order to draw more precise conclusions. Where learning takes place can also impact learning. Environmental factors should be taken into consideration when attempting to create the best learning conditions. Below are common environmental factors that should be considered when attempting to create the best learning conditions. Some kids must have total quiet in order to work while others have their iPod plugged into their ear at all times. Believe it or not, those who must have the noise are able to learn while listening to their music. If you have a child who can’t take noise, you might want to consider a set of quality soundproofing ear muffs which are easily found at sporting goods stores. Some teachers have been known to keep rooms chilly in order to keep their students awake. Having the right temperature plays a key role in learning. If your child is too cold or too hot, they will struggle with concentrating on their work. If you have one child who likes it cold and one who likes it hot, lean toward the cooler temperture and have the other child add layers. Some kids prefer to work in dimly lit areas and others want the overhead light and a lamp on. Everybody’s eyes react differently to light. Some kids may even get a headache when too much light is present. Fluorescent lighting has been linked to distractions for ADHD kids. Natural lighting or Ott lights (true spectrum) lighting might be helpful, especially in the winter. As discussed previously, some kids learn best by movement. You will want to make sure these learners have plenty of opportunity to tap their fingers or toes on the floor or table, fidget with their hair, use a stress ball, chew gum, thump their pencil, pace… It is absolutely natural for them in order to retain information more efficiently. Studies have shown everyone needs breaks in order to improve productivity and this is definitely true for high school kids. The human body is built to move. Sitting still for too long can cause learning to slow or stop. Remind and encourage your child to stand, stretch, and take short breaks as needed during studying. It is good to study in 20-30 minute increments with a brief break between each block of time. Research has shown that it only takes 30 seconds to rest and recharge the brain. Below is a sampling of ways to enhance teaching, understanding, and retention based upon specific learning styles for BOTH teacher and student. Create mnemonic devices or rhymes to memorize facts, lists…then to make the most out of it, set them to a jingle or part of a song. Aim to understand the reasons behind lessons and skills. Don’t just rote learn. Understanding more detail behind the lesson content helps you memorize and learn the material that you need to know. Think about why it is important and what it relates to. Be creative with role-playing. You don’t always need other people to role-play with, because you can create plenty of people using visualization! For example, you can visualize your learning coach, sibling, or fellow co-op student beside you, as you practice a particular skill or lesson. Work with them and talk to them while you visualize. By now you are aware of what learning styles are, the various different styles, how to find your prefered style, ways environment affects learning styles, and how to best utilize your prefered style(s) to impact not only your child’s learning, but also the way in which YOU impart learning to your child. Using multiple intelligences to teach your child is only one part of a very integrated homeschooling experience. Most everything you do along the homeschool journey builds upon itself. You are not going to harm your child academically if you have been teaching with mismatched styles. Kids tend to learn most of the time despite what we as the learning coaches do or do not do. They are resilient learners. The idea behind this article is to try to give insight into an area that has potential to make learning more enjoyable and beneficial. Your dedication to homeschooling your child is number one. Your child senses that in you. You CAN do it! Jackie, a former public and private school teacher, enjoys homeschooling her 16 year old daughter via Time4Learning's new high school courses and other supplementals. Jackie keeps busy writing study guides, educational articles, and literature units for various online education companies as well as acting as an online marketing consultant. She is a contributing author at 3 D Learners. Excellent article on learning styles ... it is imperative to determine the style so your (teacher) style can be applied correctly.